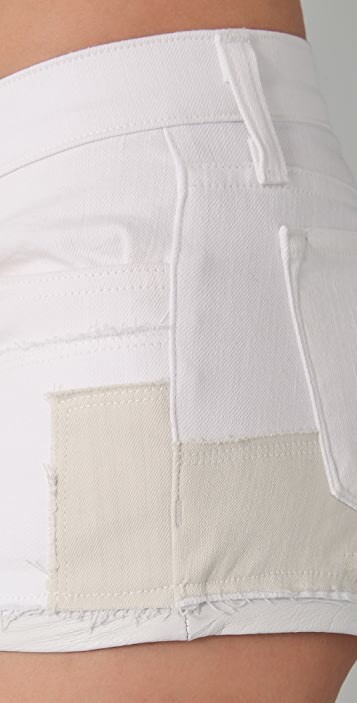 These tonal patchwork denim J Brand shorts feature leather trim at the cuffs and belt loops. 5-pocket styling and single-button closure. * 8.5" rise. 1.5" inseam. * 94% cotton/5% polyester/1% spandex. First short shorts I've worn in a while. Took these on a trip to LA (my first). They not only look great, are extremely comfy. Rode a bike from Marina Del Rey to Santa Montica pier & back with these on. They didn't ride up, we're cool and comfy. The suede patches are a really nice touch. Not just another pair of cut offs. Very happy with these. Came out of the wash just fine and they still look great. Back to the northeast and winter :( but will be glad to wear these again this summer!